If you’re looking for views, head up, up, up. Colorado’s mountains provide some of the planet’s most breathtaking panoramas — and even some that you can enjoy without having to break a sweat. Colorado has 26 official Scenic and Historic Byways, which are roads so interesting that they’re destinations, in and of themselves. 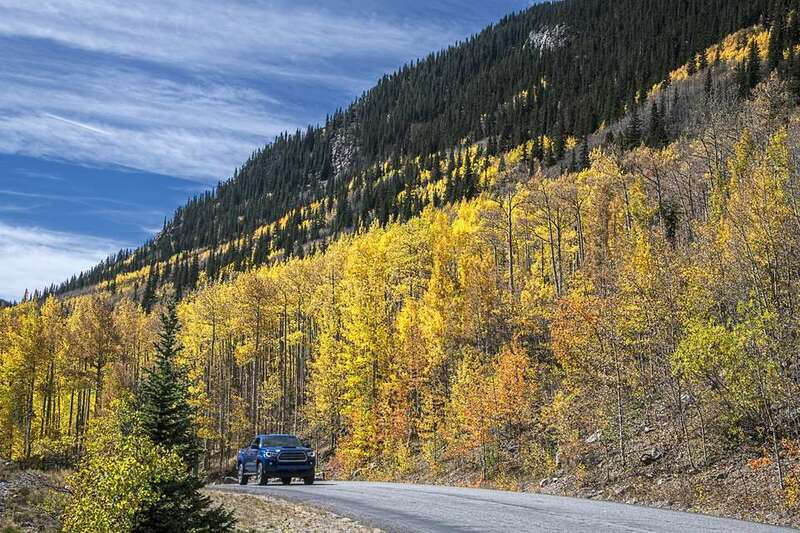 One of the best scenic byways to explore is Colorado’s Guanella Pass. This byway is just long enough to weave into a day trip. It’s about 22 miles long and takes about an hour to drive, although you may want to block out extra time to stop, take photos and explore the region it passes through. The Guanella Pass provides views of Mount Bierstadt, one of Colorado’s famous fourteeners (mountains that are 14,000 feet above sea level or taller), and it cuts through the historic town of Georgetown, one of the best preserved Victorian communities in the state. This road includes picturesque views of both nature and architecture; and it transports you into the serenity of nature, as well as seemingly back in time. Here’s a closer look at the Guanella Pass Scenic Byway and everything you need to know to incorporate it into your next Colorado vacation. Elevation: 11,670 feet above sea level. Where is it? Off U.S. Route 285 in Clear Creek County, west of Denver. It is a bit of a detour off the highway but it’s worth it. It also links the popular Interstate 70 with Highway 285, making it not only a pretty ride but useful. Road conditions: The road is paved and does not require four-wheel drive. The pass is not maintained in the winter, though, so after a big snow, it might be closed. Call the Guanella Pass Road Information Line at (303) 679-2300, extension 2, to check the status. Make sure you check road conditions before heading out. Views year-round are beautiful for different reasons. In the fall, you can see the changing colors of the leaves. In the springtime, the colorful wildflowers are stunning. In the summer, the green trees and grass play off Colorado's notoriously bright blue skies. In the winter, a serene blanket of white snow covers the ground. Length of trip: 22 miles, about one hour (or longer, depending on how many stops you take). The journey: The pass brings you between two watersheds: South Platte and Clear Creek. You will travel through spruce and aspen groves, along creeks until you hit timberline (that’s where trees stop growing due to altitude). Here, you will be able to see precious tundra. The tundra is fragile, so only used marked trails to traverse it. Never walk on the tundra itself. The weather will grow chillier as you get higher, so even in summer, dress in layers if you want to get out of the car to explore. At the top, you will find historic, old mining spots and the stunning Victorian towns of Georgetown and Silver Plume. In these areas, you can find many historical sites and attractions, as well as all levels of great trails for hiking, from relaxed to adventurous. Wildlife: Expect to see some wildlife along the drive. Animals native to this area include but are not limited to beavers, bighorn sheep (the Georgetown bighorn sheep herd is one of Colorado’s biggest herds), bobcats, falcons, bald eagles, pikas, black bears, elk, chipmunks, foxes, mountain lions, minks, porcupines, raccoons, mountain goats, wolverines, the yellow-bellied marmot and more. You never know who you might see crawling around, so keep your camera at the ready. Note: Of course, be smart around wildlife. If you do run across a black bear, mountain lion or elk, don't be a fool and try to take a wildlife selfie or get out of the car to get a closer view. Stay in your car and leave the animals alone, not only for your sake but also for theirs. Wild animals can be unpredictable, and it's not worth the risk. Georgetown: Historic Georgetown (incorporated in 1868) is a tiny town that leaves a big impact. This former mining town has done a great job at preserving its history and architecture. We recommend stopping your drive to walk through Georgetown’s downtown. Equally as splendid: Head on one of Georgetown’s trails deep into the backcountry and go for a hike to stretch your legs after the drive. While in town, look for special events, like the Georgetown Home & Garden Tour in the summer (typically late July), when private homes open their doors to the public to share their stunning homes. You can walk through real homes, museums and churches and pretend you live in the Victorian times. Another fun activity in Georgetown is to take a ride on the Georgetown Loop Railroad, with one particularly breathtaking spot perched nearly 100 above Clear Creek. Learn about the mining history on this fun ride and if you want, you can even explore an old silver mine — with a guide and hard hat, of course. The Historic Hamill House Museum: This restored "Country Gothic" house is arguably the main attraction in Georgetown’s historic district. It’s elegant and perfectly preserved, down to the decoration and furniture and even landscaping techniques. On the walls, you can find the original wallpaper and throughout the building, original furniture. It's one of a kind. While there, see an exhibit about the pioneers who helped build this community. This historic organization that owns this house holds other special events throughout the year, too, including a paranormal ghost tour around Halloween time and Christmas programming. The Hotel De Paris Museum: This historic hotel dates back to the late 1800s and has been converted to a museum. It's not just beautiful; it also has a sweet story. Back in the day, the residents of Georgetown banded together to help a miner start the hotel after he was injured from saving his friend in a mine blast. It has remained a staple of Georgetown ​—​ and its community spirit —​ ever since. The Georgetown Energy Museum: OK, the idea of an energy museum might not immediately get your heart racing — but this one’s actually pretty cool. It’s the oldest continuously operating AC hydroelectric plant in Colorado, functioning since 1900. It’s one part electricity generator, one part history museum. Stop by; you are sure to learn something. It's great for families traveling and seeking an educational experience along the way. Mount Bierstadt: No visit to Colorado is complete without gazing upon, shooting photos of or, if at all possible, visiting the top of at least one fourteener. This one is 14,065 feet. The hike to the top is considered intermediate, with a total elevation gain of 2,850 feet over seven miles roundtrip. Many people consider this a great first-timer fourteener because it’s relatively easy — well, for a fourteener. The trail really only gets tough at the end. Make sure you are prepared for the exertion and the altitude. Drink plenty of water and prepare with a smartly packed backpack before heading out. You can find the trailhead off the Guanella Pass Scenic Byway, 12 miles to the top of the pass. You’ll find several parking lots and the trailhead nearby. This trail is pretty popular, especially during the summer, so if you can make it out here earlier in the day, you might miss the rush. (You can even bring your on-leash dog.) The Mount Bierstadt Trail is best explored in warmer weather, June through September. Silver Plume: Another town worth visiting in the Clear Creek area is Silver Plume. Stroll down the charming Victorian downtown, shop for antiques, grab a cup of tea, get a bite to eat at the bakery, see the 1884 depot, explore an old 1870s silver mine, learn about the history of the railroad in the rail yard and even take a train ride. The Geneva Basin Ski Area: Another fun point of interest is this former ski area, a few miles south of the Guanella Pass. This ski spot was open from 1963 to 1984. No, you can’t ski there anymore (it lacks the snow), but the views are still stunning and the history is novel. It's not every day you get to see a closed-down ski area.